How far would you go to understand how we got here? 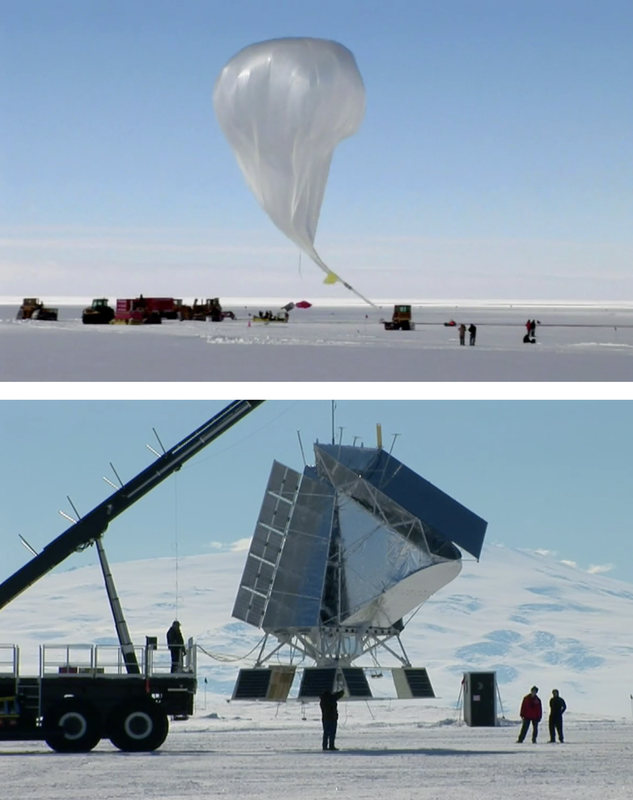 2011 launch of BLAST in Antarctica. The question flashes across the screen in the trailer for the 2011 documentary BLAST!. The camera cuts to Mark Devlin as he oversees the launch of a massive high-altitude balloon against the backdrop of the Antarctic. It’s a moment Devlin plans to recreate in December 2017 with the fourth launch of BLAST, or Balloon-borne Large Aperture Submillimeter Telescope, a sophisticated telescope that detects submillimeter light from distant star-forming clouds of dust and gas, providing clues to how stars and galaxies were formed. Devlin, Reese W. Flower Professor of Astronomy and Astrophysics, is not only project lead, but a mentor for a cohort of undergraduate and graduate students working on critical components—everything from navigation electronics to cooling systems—in preparation for BLAST’s upcoming fourth launch. 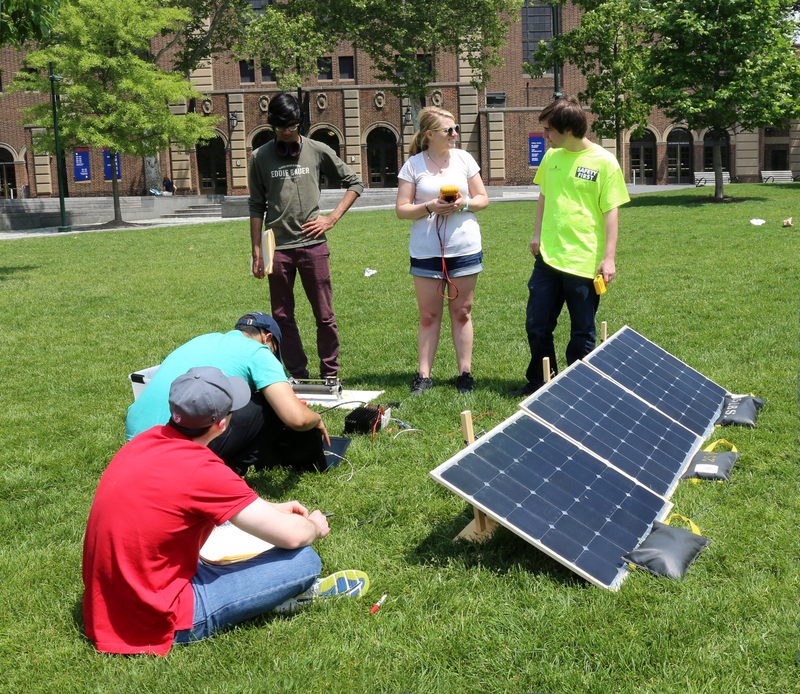 Nathan Schor, C'19, Aaron Mathews, C'17, Amarsingh Gawande, C'18, Erin Healy, C'12, LPS'17, and Michael Plumb, C'18, ENG'18, testing the performance of the solar panels on the lawn outside David Rittenhouse Laboratory. The frames that mount these solar panels were designed by physics major Michael Plumb, C’18, ENG’18. “We needed something that was lightweight, structurally stable, and would hold the solar panels without breaking them or clamping them too hard,” says Plumb. Much of the work on BLAST takes place in the high bay, a large structure on the Penn campus that houses the gondola, the part of the telescope that will be lifted via balloon into space. “I’m working on the electronics of the gondola, which includes the flight computers in charge of the navigation, and the power distribution box, which runs through the solar panels and the batteries to the rest of the components,” says Amarsingh Gawande, C’18, a physics major. 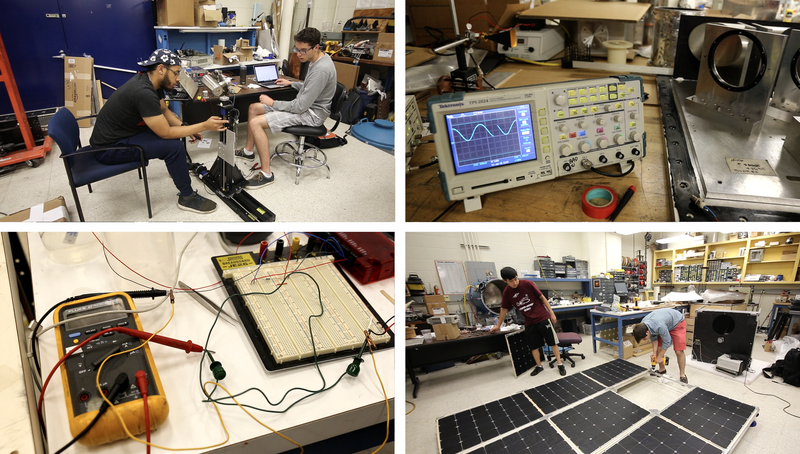 Clockwise from top left: Aaron Mathews, C'17, and Matthew Riley, ENG'19, testing a motorized xy-stage; oscilloscope reading out a waveform from a Fourier transform spectrometer; Michael Plumb, C'18, ENG'18, assembling a solar panel array with visiting high school student Olin Wei; circuit board and multimeter used for testing temperature sensors. The goal for the 2017 flight is to make measurements of polarized dust emission in star-forming regions of the galaxy. These measurements will help the researchers determine if galactic magnetic fields play a dominant role in suppressing star formation in galaxies. Sebastian Gonzalez, C’20, is a campus leader for first-generation students, a physics and astronomy major, and the principal tubist for the Penn Symphony Orchestra.